My nearest and dearest already know my love affair with Damas, the Middle East’s leading jewellery and watch retailer whose staff make me feel oh so good whenever there is an occasion to celebrate. Whether it’s a birthday or a special event. So Mother’s day is here and little diva always has something nice for me as I have made her aware that the 8 hours of labour I went through was horrendous and that I deserved a medal for surviving that but a small trinket every tear would suffice. The great news is that Damas has unveiled its 2013 Mother’s Day Collection, featuring four limited-edition pendants designed to show appreciation for the most important women in our lives: our mothers and in particular, moi, the best in the world….well at least I think I’m a cool mum. All the pieces feature the word “Ummi”, endearingly meaning ‘my mother’ in Arabic calligraphy, highlighted by a variety of designs. The ‘Center of My World’ pendant displays a circular motif, crafted in loops of 18k yellow gold, offset by rings studded with round brilliant diamonds. The ‘Ummi’ lettering is positioned in the centre of the piece, representing the mother’s place at the heart of the family. Show your mother you care with this stunning piece, priced at AED 1,790. The ‘Heart of Gold’ pendant is comprised of a pear shaped design with the ‘Ummi’ lettering surrounded by a halo of hearts, representing the love surrounding the mother, who is the lifeline of emotion. The design is then encircled by exquisite colored gem stones. This gorgeous piece is priced at AED 2,990. The ‘Love’s Rainbow’ pendant has a tear drop design, accented by round brilliant diamonds, semi precious stones, and fresh water pearls. The ‘Ummi’ calligraphy is followed by vividly colored, semi-precious stones, and delicate pearls representing the combination of excitement and grace that mothers embody. This piece is priced at AED 2,490. Finally, the ‘Heart’s Delight’ pendant features the ‘Ummi’ calligraphy with larger lettering, in a mix of white and yellow gold, accented by semi-precious stones, diamonds and fresh water pearls. 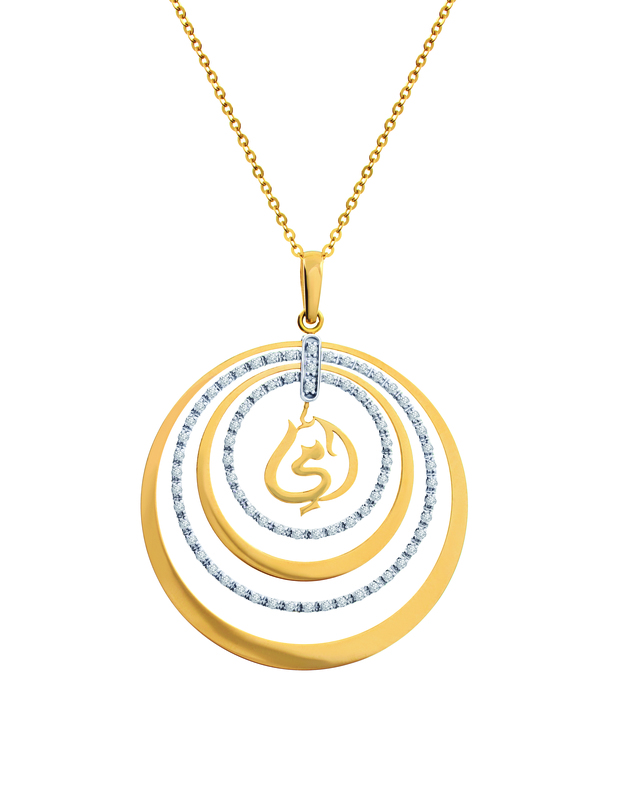 This heartwarming piece is designed to symbolize the mother as the center of attention, and is priced at AED 1,390. I wonder which one I am getting …HINT!